When I received a copy of Cucina Povera, a new cookbook by Pamela Sheldon Johns, I couldn’t stop turning the pages. Not because it has glossy pages with slick copy – it doesn’t. I was drawn to it because of the rustic, matte feel of the paper, the jagged, deckle edges of each page and most of all, the beautiful photos, recipes and stories of the people whose very lives and traditions are outlined in this book. 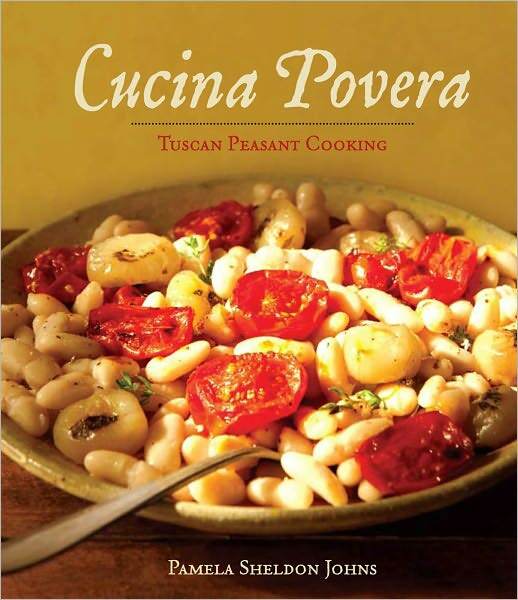 For these people, cucina povera (peasant cooking) was a necessity. And even though most of us can afford to indulge in small culinary luxuries nowadays, that doesn’t mean we shouldn’t respect the bounty that’s available or waste food either. Eating what’s in season, making simple dishes from the freshest ingredients, and preserving foods for the lean days of winter are lessons we can all benefit from in order to live healthier lives and preserve resources. 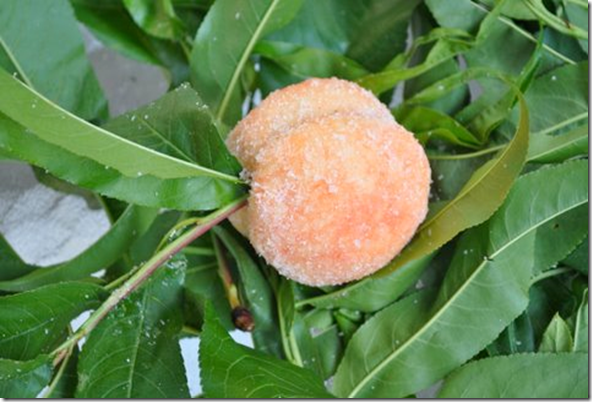 Cucina Povera contains delicious recipes – from soups to pastas, meats and vegetables to desserts like this cookie called “sfratti,” plural of the word “sfratto,” which means eviction. These cookies are one of the old recipes from Pitigliano, a Tuscan town that once housed a large Jewish population. Sadly, many of the Jews were forced to flee during World War II, following Mussolini’s racial laws. 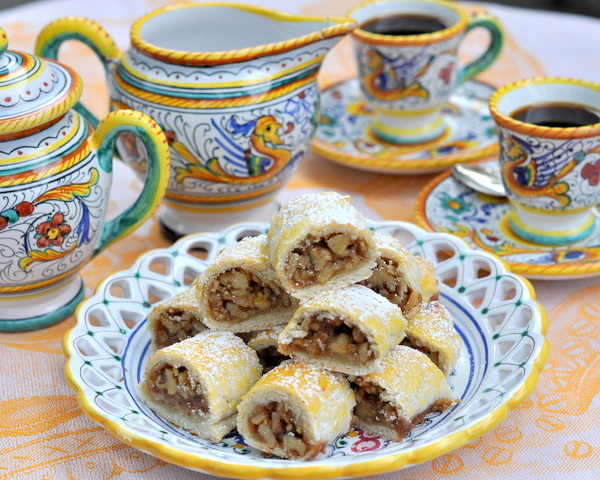 This recipe is a traditional Rosh Hashanah treat from Pitigliano’s Jewish heritage. Sfratti may be considered “cucina povera” but there’s no feeling of deprivation once you’ve tried these. Here’s a visual guide on how to make them, followed by the recipe. 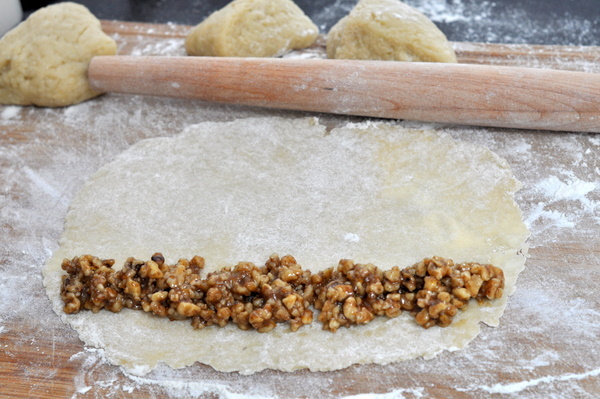 After you’ve madethe filling, spread it out on the rolled-out dough. 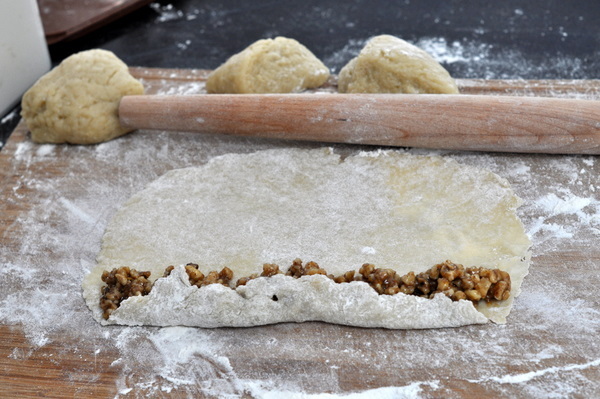 Roll the dough over the filling. Continue rolling until you have something that looks like a large cigar. The shape is meant to evoke the batons that officials used to bang on the doors of Jews to evict them. Brush with beaten egg yolk and bake. Betcha’ can’t eat just one. Those rolled cookies look amazing! The filling is just marvelous. excellent recipe – I might be "borrowing" this for some cocktail parties I have coming up – Thanks! They do remind me a little of rugelach but the sweet wine in the dough really intrigues me. Since I am making a New Years dinner on Thursday I will give this a try. It's always fun to put something new on the table. 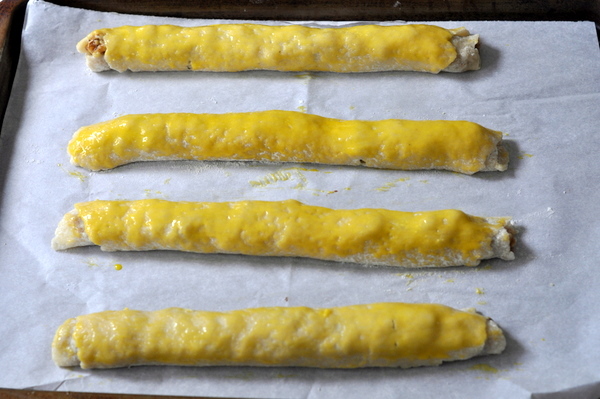 I love all the stories behind the food like rolling them into batons and what that all meant. Would you believe my family dosen't like nuts in cookies! Whats wrong with them? This would be very dangerous for me to have around because I love nuts of all kinds. I'll make them during the holidays and share them with my friends they look amazing! Oh I've got to get a copy of this book. Love to read the stories behind delicious recipes like this one. my grandmother used to make these…i haven't had one in years! thank you for showcasing this recipe. i can't wait to make these for my mom! 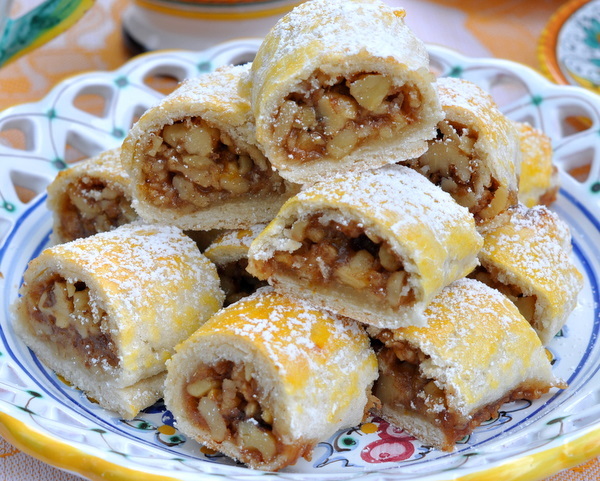 Love these desserts/treats with nuts, honey & spices…old world and they are still popular. I'll look out for the book. ooooooooh… how delicious! This look like a cookbook I need to have in my library! I first saw this cookbook on Marie's blog. It sounds like a treasure, Linda! Sfratti sound delicious/ They are the type of cookie I'd enjoy eating as I love nuts. What is there about peasant, rustic cooking that welcomes you home? This does. I "dislike" that I covet the book – and your pottery when really I am blessed enough – but I do. They look yummy and will add to my holiday baking. Sounds like an Italian take on Rugelach. 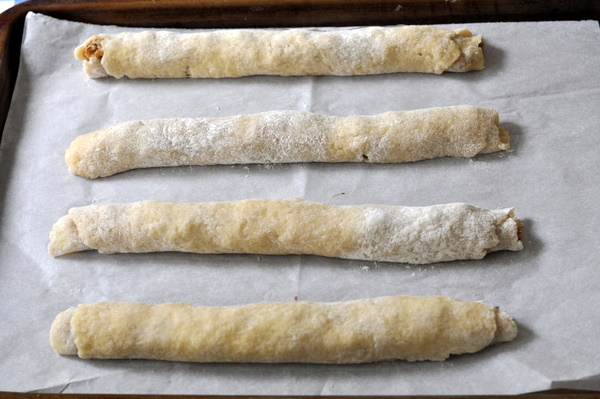 They definitely look like a cousin to rugelach…everything all goes back to the same roots more than likely! Thank you for posting this…I need to look for this book. This rolled cookies look wonderful; the dough is similar to the one used for olive roulade in the middle-east and Greece I believe. Interesting book. That looks so delicous, Linda. And I love your Deruta coffee set! I found a little creamer like that in a consignment shop recently. Wow, I can't wait to make these! Oh dear, I'm sure I would eat many more than one. I'm always looking for new recipes for my Christmas plates and I think this would be perfect. I love the stories that go along with your recipes, Linda. Who would want to eat just one? This look so good! I am thinking of all the other wonderful filling you could also roll into these. Great book too! These are such a unique dessert. I am sure that cookbook is amazing. I am sold! I am your newest follower 🙂 I love your blog and cannot wait to see what you post next. I made these today. I left the sugar out of the dough because the wine I was using was so sweet, and I like things less sweet overall. Used some almonds with the walnuts and a fash of vanilla extract in the filling. They came out fantastic! Thank you!